Today was Gideon Sunday, at least where we live. 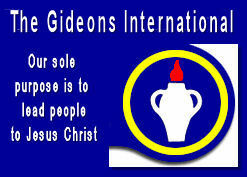 I wrote about the work done by the Gideon’s International last year. I’ve also written before about sowing gospel seeds, based on the parable in Mark 4. Just this morning I noticed a strong correlation between the two. At the beginning of Mark 4 Jesus shares the parable of the sower with a large crowd. He later explains the meaning of the parable with his disciples. The seed is the Word, and the various types of soil represent different types of responses to hearing it. But that’s not the only parable Jesus shares on this subject. Reading on we learn that the farmer may not understand what happens after the seed is planted, but in due time the seeds sprout, the crop grows to full size, and he reaps the harvest. The parable of the mustard seed is all about how a tiny seed yields a great return. Mark says that Jesus taught many more such parables. Let’s put them together: when we sow the seed of God’s Word, much of the effort may appear to be wasted. Only some of the seed will fall on good soil. We are told in scripture that wide and easy is the path to destruction, and that many will go that way. But of the seed that falls on good soil, the yield can be 30, 60 or 100 fold. We share the Gospel, spreading God’s Word, and a few people will become believers, abundantly producing the fruit of the Spirit! A tiny investment can produce great results; remember God’s promise that “little is much when God is in it.” Ultimately we do not understand, nor do we need to, why and how God works the way he does. The farmer does not understand how the seed produces a crop, but when the time comes he collects the harvest. The application for the believer is to just keep sowing God’s Word. Paul says one may plant, another water, and that God gives the increase. I thought about these parables in Mark 4 as one of our local Gideons talked about printing and handing out God’s Word. Preaching a sermon is one way to share the Gospel; teaching a Bible class, Sunday School or VBS lesson is another. We can all talk to our friends, neighbors and co-workers. Gideon Bibles offer the unique opportunity to reach total strangers with the Word of God; random people staying in a hotel room, patients in hospital rooms, or prisoners serving sentence behind bars. The Gideon’s hand out New Testaments to elementary school students (when allowed), college students, and to men and women in uniform. At 2 a.m. in a lonely hotel room, or perhaps a world away on foreign soil, may be the moment that God deals with a heart and that person becomes good soil in which the seeds of his Word can grow. You or I may not be readily available, but a Gideon Bible probably will be. Every dollar given to the Gideons goes to buying Bibles; all administrative costs, travel expenses, etc. are covered by the Gideons themselves. Again, this post talks about praying, giving and going. We have been blessed, in many different ways, so that we can bless others. Let me leave you with one final promise of scripture: the Word of God will not return void. Keep sowing the seeds, and trust in God to do what only God can do. This entry was posted in Bible, Christianity and tagged Gideons, Gideons International, God's Word, gospel, Jesus, Mark 4, parables, seeds. Bookmark the permalink. One of the biggest thrills in the Gideon ministry is reading/hearing “returns” – testimonies from those who came to know Christ through a Gideon placed or received Scripture. Another thrill is hearing from those who have returned from an overseas Bible placement – but this is also tinged with sadness as we realise again the desperate HUNGER for the Word in some countries. Yet another thrill, and by no means the least, is the freedom to give away a New Testament to people we meet. These are always gratefully received and yes, the promise of God holds. His Word will not return to Him void.